Digital SLRs have much more dynamic range than their film (and especially their slide film) counterparts. Even so, sometimes you just want to get that little bit more from them. Step forward HDRI, High Dynamic Range Images, sometimes just plain HDR. There are various commercial software offerings to blend your images into an HDR, and I've tried most. Now though I've found one that is free, under the GPL, and is simply great. ImageFuser. Its basically an OSX GUI for Enfuse, which is a really powerful images processing engine. 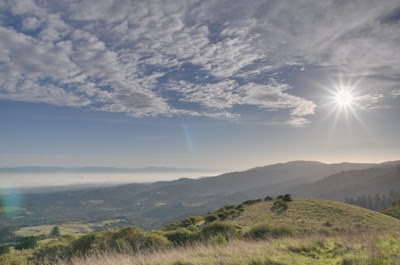 Here's an example photo, a sunrise over the Bay Area, estimated dynamic range 15+ stops.